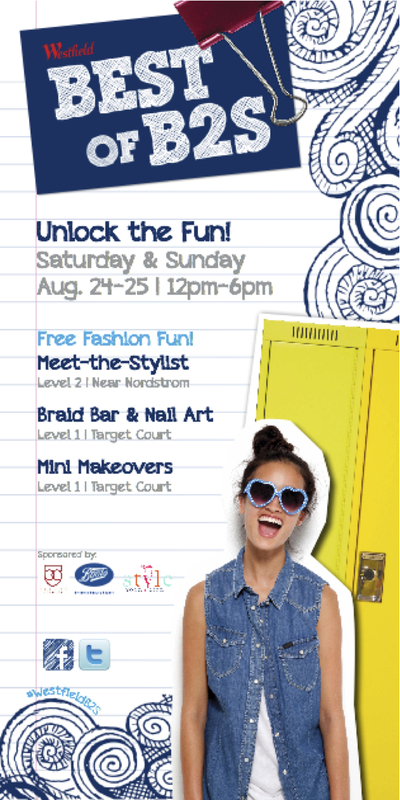 Westfield North County (WNC) is welcoming the back-to-school season with its ‘Unlock the Fun’ fashion event, helping teens and tweens “unlock” the hot styles and trends for the new school year. San Diego-based national style expert Jennifer Rosson, founder/owner of Style Your Life and an elite Stylist For Hire hand-picked by “What Not To Wear's” Stacy London, will be on-hand to offer her personal styling tips. As a part of Westfield’s exciting back-to-school style campaign, shoppers will also have the opportunity daily to unlock an interactive locker display for exclusive deals, with the chance to win exciting prizes including an iPad Mini, gift cards and concert tickets to some of the hottest acts in music today. 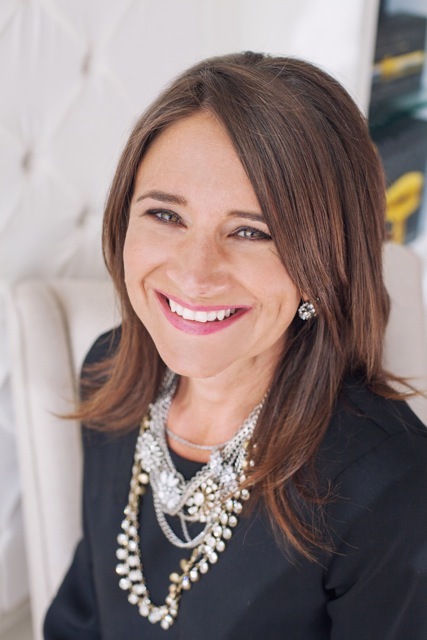 At WNC’s complimentary ‘Ask A Stylist’ station, Rosson will share everything there is to know about the hottest back-to-school trends for tweens and teens, including awesome 80’s, mixing prints and patterns, and military-inspired styles. For the ultimate first day back to school, Rosson will create stylish looks from items available at many of WNC’s most popular retailers. Shoppers will also have the opportunity to ask Rosson for customized style tips and receive answers to their most pressing personal styling dilemmas. The “recipe” for each of Rosson’s recommended looks will be sent directly to their mobile phones to reference as they complete their back-to-school shopping. To complete shopper’s back-to-school looks, additional complimentary “Unlock the Fun” attractions will be located throughout the mall. Bellus Academy will host a Braid Bar offering back-to-school worthy do’s and mini-manis complete with colorful nail art. Make-up artists from leading UK-based cult brand Boots Cosmetics, available at Target, will be giving shoppers glam mini-makeovers and sharing their expert beauty and skincare tips. Daily from Thursday, August 22nd to Sunday, August 25,th during mall hours, shoppers at WNC can text to receive a combination that may unlock one of five colorful, oversized interactive lockers featuring fabulous prizes from WNC’s retailers. Texting one of the SMS phrases to 51515 will give shoppers the chance to receive the code to open a locker holding surprises like, Maroon 5 concert tickets, on-trend clothing, an iPad Mini, back to school supplies and gift cards. Those who can’t make the fun in person can participate by following local mom blogger Kludgy Mom and teen Vlogger JaaackJack who will be sharing the fun and showcasing their WNC back-to-school experiences on Facebook, Twitter, Instagram and YouTube. Shoppers can follow stylist Jennifer Rosson on her blog Style Your Life for more expert back-to-school tips- and to enter a giveaway for a Tween’s Day Out that includes a $300 Westfield North County gift card and a personal back-to-school styling session for the winner and their best friend. 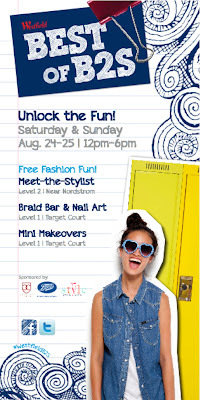 “Unlock the Fun” will be held indoors at Westfield North County with the locker installation located at Level 1 - center court; back-to-school styling at Level 2 near Nordstrom; and Braid Bar, mini-makeovers and nail art at Level 1 near Target court. This is a free family event for all ages. For more information on Westfield’s back-to-school promotions and services, as well as information on entering the back-to-school Facebook contest, please visit www.westfield.com/northcounty, Westfield North County’s Facebook page, call 760-489.-0631 or follow our Twitter updates at @WestfieldNC.